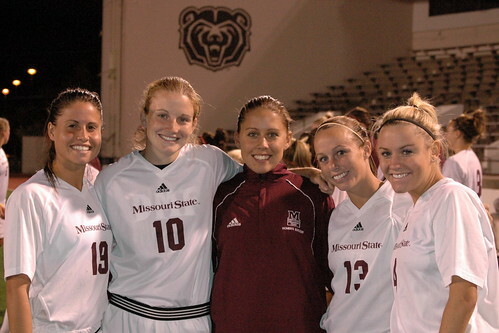 Kate Hercules, a senior on the Missouri State women’s soccer team (second from left in the photo), was selected to the 2006 National Soccer Coaches Association of America/Adidas NCAA Division I All-Central Region third team. The 2005 Missouri Valley Conference Defensive Player of the Year started all 21 matches for the Bears in the 2006 season. She tallied eight points on three goals, including one game-winner and two assists. Hercules was selected to the All-MVC first team and to the Valley All-Tournament team. The defender was named to the MVC Scholar-Athlete team and was selected to the ESPN The Magazine/CoSIDA Academic All-District VII second team for her excellence in the classroom. The Kansas City, Mo., native ends her four-year campaign at Missouri State with 32 career points. She has posted 90 shots with 14 goals, including five game-winners and 10 assists.